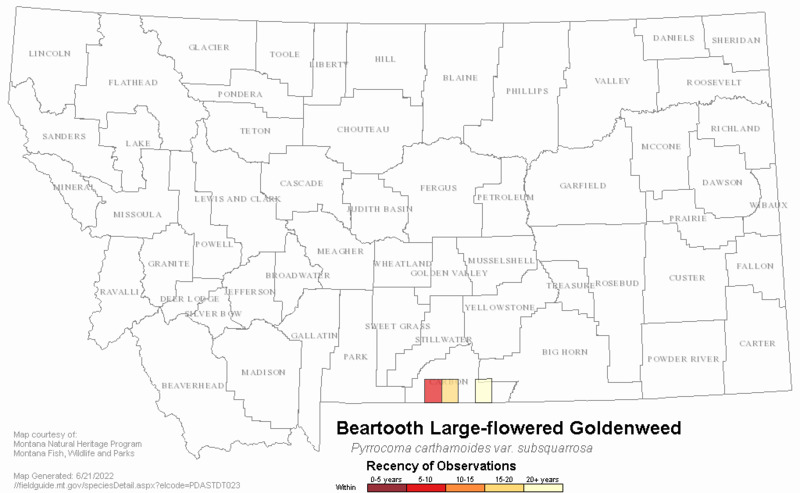 The Beartooth large-flowered goldenweed is a local endemic to the eastern front of the Beartooth Mountains and the foothills of the Pryor Mountains and adjacent areas of Wyoming. Although several populations are large, it is vulnerable to increased shrub and tree cover due to fire suppression and to competition from invasive plants. Score 7 to 10 total points scored out of a possible 19. Flowering occurs in late July - August. Beartooth large-flowered goldenweed is distinguished from similar composites in south-central Montana by its spiny-margined leaves and involucral bracts, and large heads with inconspicuous yellow rays. 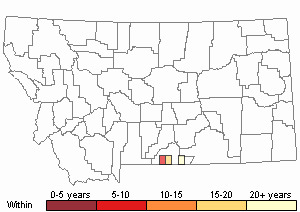 Regional endemic of southwest Montana and the Absaroka Mountains of northwest Wyoming. The Beartooth large-flowered goldenweed typically occurs in grassland and sagebrush habitats dominated by Festuca idahoensis/Agropyron spicatum, Artemisia tridentata/Festuca idahoensis, and Artemisia arbuscula/Agropyron spicatum (Lesica 1995). Shrub cover is typically low (1-5%), compared to that of graminoids (20-50%) and forbs (30-75%); bare ground ranges from 5-30%. Some sites support scattered Pinus flexilis. This plant is found most frequently and abundantly on moderate to steep slopes (10-50%) with a cool aspect (NW, N, NE, E) (Lesica 1995); on warmer exposures, it tends to be sparser. Soils tend to be moderately deep, sandy, and high in coarse fragments. It occurs largely on soils derived, at least in part, from Madison limestone, though small satellite populations occur on soils derived from granitic materials (in the Rock Creek valley) and volcanics (in Wyoming). Fire plays an important role in structuring the vegetation in this species' habitat (Lesica 1995). Beartooth large-flowered goldenweed grows in areas with a very low cover of Artemisia tridentata, which dominates much of the adjacent lands. The relationship among Beartooth large-flowered goldenweed, A. tridentata and fire is not known, but it may be that the goldenweed does not tolerate the shade created by dense stands of A. tridentata or Pinus flexilis (Lesica 1995). If that is true, the goldenweed will occur only at sites where A. tridentata and/or P. flexilis will not grow, or where they are burned frequently enough to prevent dominance. Bumblebees (Family Apidae, Bombus spp.) frequently visit the flowers of this goldenweed, and sulphur butterflies (Family Pieridae, Colias spp.) have also been observed visiting flowers (Lesica 1995). Seed production is probably not limited by pollinators, since this is one of relatively few plants blooming in August, when pollinating insects are common. The achenes have numerous capillary bristles, and are likely dispersed by wind in late summer and fall when they are shed (Lesica 1995). Deer or elk may also disperse achenes that become attached to fur. There is evidence that fire is important for maintaining at least a portion of this species' habitat along the Beartooth Front, where it is most abundant in mesic grasslands on cool slopes. These are the habitats most prone to encroachment by Artemisia spp. or Pinus flexilis, however the goldenweed does not occur within dense or even moderate stands of sagebrush or pine. A significant increase in sagebrush and pine due to fire suppression could greatly reduce habitat for this plant in the foothills of the Beartooth Mountains, and burns may be important for maintaining viable populations over the long term. Many populations are found on lands grazed by cattle, which is probably not detrimental to this species and may even favor it at moderate levels (Lesica 1995). While grazing can increase sagebrush cover, which is likely detrimental to Beartooth large-flowered goldenweed, it may also decrease the vigor and abundance of palatable grasses that compete with this forb, thus allowing it to increase. Therefore, cattle grazing, by itself, is likely to have a positive or nominal effect on Beartooth large-flowered goldenweed's abundance. However, many forbs that are unpalatable to cattle provide fair to good forage for domestic sheep, thus sheep grazing could negatively impact its abundance (Lesica 1995). The widespread introduction of aggressive exotic plants could pose a pernicious threat to this species. Centaurea maculosa (spotted knapweed) occurs along roads as well as in native grasslands along the Beartooth Front, where semi-arid climate and gravelly soils contribute to its spread (Lesica 1995). Leafy spurge (Euphorbia esula), another aggressive exotic that has been observed in the area, could also pose a serious threat. It will be particularly important to minimize the introduction of aggressive weeds and to control infestations along roads, to prevent their spread into the native grasslands. Lesica, P. 1995. Conservation status of Haplopappus carthamoides var. Subsquarrosus in Montana. Unpublished report to the U.S. Forest Service and the U.S. Bureau of Land Management. 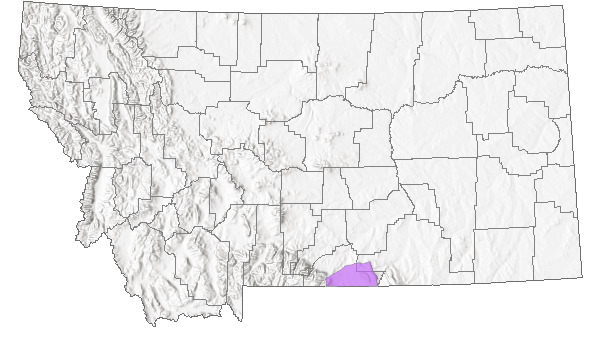 Montana Natural Heritage Program. Helena, Montana. 22 pp. plus appendices. Web Search Engines for Articles on "Beartooth Large-flowered Goldenweed"